Image from Pizza La's web site. I really like avocado, but I'm not one of those people who is trying to figure out new ways to incorporate it into my diet. I've seen recipes for chocolate pudding, cake, and, of course, the ever popular egg baked in half an avocado. It's not that I'm a purist, but I just think some flavors aren't meant to be combined with avocado. I wouldn't put chocolate syrup on one. I wouldn't sprinkle it with sugar. That's why I wouldn't put it in pudding or cake, though I'm sure that it "works" on some level and many people enjoy those things. I have never thought about putting avocado on pizza, but the truth is that I think it's a flavor that would likely work. The creamy texture would also bring something to the table. The only part that I have doubts about is whether or not it'd be okay hot and wouldn't turn to mush if cooked. I think Pizza La has actually hit upon an interesting idea, though I'm not sure if the full execution is one I'd embrace. 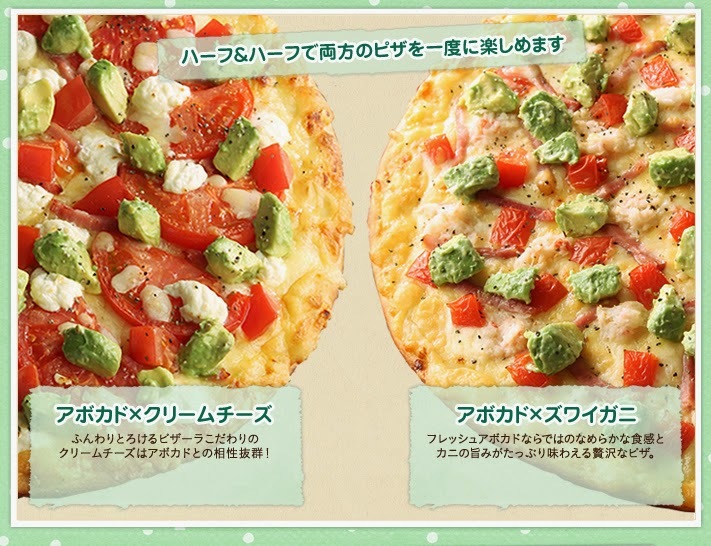 The pizza on the left is avocado and cream cheese. The one on the right is crab and avocado. I never really cared much for Pizza La's pizza (the tomato sauce had a funny taste in my opinion), but I find these toppings interesting and may have been persuaded to try them.